Enable/Disable what Showbie has access to on your iPad: microphone, photos, notifications, etc. 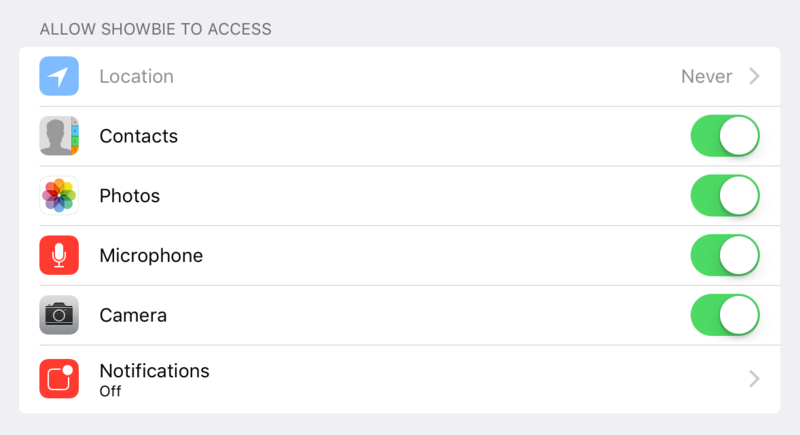 Permissions will ensure that the limit does not exist when using Showbie. Certain features in Showbie will require special permissions. Here’s how you can control what Showbie can access! Don’t see the same permission settings as above? If Showbie hasn’t asked for permission, then the option to deny won’t appear. When inviting teachers to a group, allow Showbie access to your contact to easily select who to send invitations to. Allow Showbie access to your camera roll in order to select which photos/videos to upload. Allow Showbie to use your iPad’s microphone to record voice notes. Allow Showbie to access your camera so that you may take pictures/videos and upload to Showbie right away. Toggle Showbie iOS notifications on/off. You can adjust your email preferences for Showbie so that you receive emails when something new is added. With permissions all set, uploading files should be a breeze! This guide can help you out for all things related to uploading files.